Savoring every memory together and growing in the process ! Brooklyn- "I'm so scared I wish I had a ham sandwich to calm my nerves." She said this today as we are driving in the car. Turns out it is a quote from Shaggy. It took me completely off guard and I just could not stop laughing. Her voice was so sweet ! I love that she is in a joking phase now and wanting to make people laugh more and more. She also enjoys making up stories. It has been SO fun to watch her put one together right off the top of her head. She is SO imaginative ! I do wonder if this is also a sign to me that she may be watching Scooby Doo too much. She still LOVES that show. 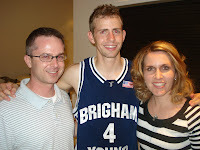 Our wonderfully talented nephew, Jackson, was in town playing with the BYU basketball team tonight . We ofcourse had to go and brag that we were related to such an awesome ball player. 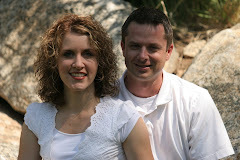 :0) We also decided that it was a great opportunity to initiate a double date with our new friends Mike and Sarah. So we enlisted a sitter and grabbed some food at the local Cafe. We then got to see Jackson start in the game against Pepperdine. He did FABULOUS I have to say and ended up with 9 points, 9 assists, 2 rebounds and 2 steals for the game. The score ended up being 82-53 BYU ! We really enjoyed watching him and are always so impressed with his humility amongst his great talent. It was great to catch up with him a bit afterward and have some good laughs. We had the added bonus of also visiting with a handful of other members from our ward. Thanks Jackson for providing us with such great entertainment... You're Awesome ! 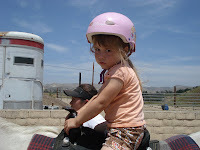 For the past few years now we have spent many of our Saturdays horseback riding at a nearby ranch. I feel EXTREMELY fortunate that we have this particular ranch so close to our house. We have several different ranches in our city as well as in the surrounding cities close by. I LOVE horsebackriding ! I have ever since my Girl Scout Troop went to a stable in Newport beach and took riding lessons after we raised enough money from selling girl scout cookies. Then a few years after that my aunt and uncle bought a house with some horse stalls and owned a few horses for a handful of years. So everytime we went to visit I remember spending hours riding and just being in HEAVEN. It is such a great childhood memory for me. 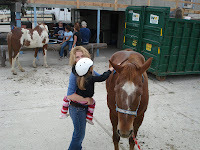 So every Saturday I get my horse fill by taking the girls to a wonderful place called the H.E.L.P ranch. The letters stand for Handicapped Equestrian Learning Program. It is owned by a WONDERFUL elderly man named "Pete" . He is a very generous and compassionate man that has been offering his services for over 30 years. 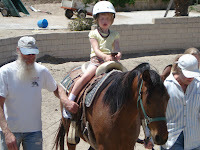 He started horsebackriding in the special olympics at one time with his beloved wife. She has since passed but he keeps it going and does such a great service for the special needs community in our area. He has a HUGE heart and therefore does it by optional donation only ! I feel so lucky to have this in my own community. 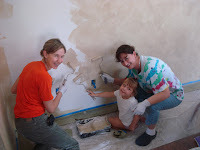 It is strickly run by volunteers who are wonderfully patient and compassionate. The girls are always thrilled to go ( don't be fooled by their serious expressions :0)and it is an especially great activity for Madison. She keeps getting better and better about riding. She gets SO excited when she gets up on the loading ramp to get hoisted onto the horse. She continually gets better about holding onto the saddle. I am so thrilled my girls are loving it as much as I am :0). This past week my FABULOUS sister-in-laws came to stay with us. They came to do me and my family a HUGE service. Our humble little abode needed their talents desperately for some updating. My wonderful sister-in-law Alicyn is an AMAZING faux painter and makes masterpieces on walls. She is a professional faux painter up in Utah where she lives. To my good fortune she had some avaliability this week to come and make miracles happen on our walls. Jakes other sister, Melinda willingly offered to come and help as well and came to visit all the way from Georgia to spend these 5 days with us to contribute her talents to the HUGE task at hand. Not only was she feverishly hard at work on the walls of our master bed and bath but she also offered her talents as our family photographer ( you will see her talents soon on my homepage but also in this years christmas card ). She knows what a priceless service this is to me. 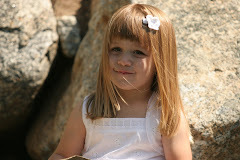 With her patience, love and amazing tools she helps to ease my stress of getting an annual family photo. These wonderful women will never know how much their services brightened my spirits. Each and everytime I look at my walls I think of their selfless service to us and their christlike qualities. My home looks AMAZING ! Ofcourse with these two fabulous aunties around Brooklyn wanted to get in on the action. She was right there at our feet much of the time asking when it was her turn to paint. 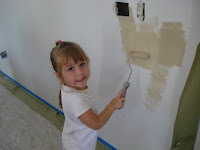 Unfortunately with faux painting textures there is not a lot of opportunity for childs play so I often had her help me paint the walls of my garage/ laundry area. 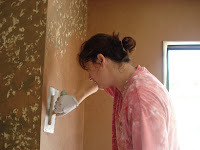 It already has a rustic texture and I felt that she really couldn't go wrong as long as the paint got on the walls. It was such a great week and thankfully even with my motherly duties tearing me aways from consistently contributing, these wonderful ladies were able to get 3 rooms completely finished ! 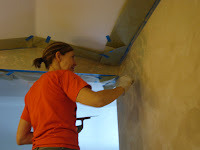 I am just in awe of the change these finishes make to my home and am excited to finish up the garage so that I can move on to the organizing part ! Such a great finale to a low key summer. Thanks Alicyn and Melinda !! (I will be sure to post updated pics once the final touches are completely finished... stay tuned). Catchin' Up and Staying Tuned ! So I knew when I started this whole blogging process that it would consistently get neglected. Sure enough it has been 2 months since my last post and LOTS has happened. Some things worth blogging about and some not but rest assured we have been VERY BUSY! To my defense May is always the craziest month for me. Every year it rolls around there are half a dozen important things that I have going on. It is our anniversary, mothers day, my mothers birthday, Madisons IEP meeting (we set up goals for the following school year), and the time when I am frantically marking my calendar and organizing the summer events to keep my children entertained! That in itself will be a whole other blog that I will post along the way. So for the past two months here is what I have meant to update you all on regarding our challenges, victories and fun outings. To keep this post simple and to keep my mind on track, I am just going to list the topics of my upcoming posts. 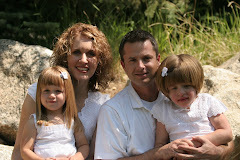 The GFCF challenge -Changing things from the inside out. So my good friend Rebecca tagged me with this ( a few weeks back... I lag!) Anyway thought it would be a fun for those of you that do not know little details about me. :0) Enjoy ! A- Attached or Single? Attached! Married 9 years in May. C- Cake or Pie? Cake ! Homemade white is my FAVORITE ! D- Day of Choice? Friday. F- Favorite Color? Red ( at the moment) but green is my favorite one to wear. G- Gummy Bears or Gummy Worms? Yuck, Neither ! Just empty calories ! I- Favorite Indulgence? Shopping ! Lately it has been at the Thrift Stores in O.C. J- January or July? July because we throw a 4th of July party with a bunch of friends and this is usually the month for the Emery Family vacation. L- Life isn't complete without? Family. M- Marriage date? May 15th 1999. N- Number of brothers and sisters? 2 brothers and 1 sister. O- Oranges or Apples? APPLES ! My current favorite are the baby Jazz apples @ TJ's. P- Phobias and Fears? Too many to mention. But clutter is a recent one. Q- Quality or Quantity? Quality. R- Reason to smile? See "K" above. My cup runneth over. S- Season of choice? Springtime ! The weather is perfect ! T- Tag three people? Amy A., Leilana and Beth ( my sister). U- Unknown fact about me? I played basketball in highschool my freshman year. V- Vegetable? Baby carrots ! W- Worst Habit? I often do not think about dinner till it is 5pm!Quesadillas it is ! Y- Your favorite food? Lemon Cake( from costco) or Key Lime Pie from CPK ! YUM ! "Dear Heavenly Father, we thank thee for this day, we thank thee for our home, please bless papi and nana, and all of our friends. Please bless Ma Ma ( Madison) on the bus that she will be safe. Please bless Ma Ma on the bus that she will buckle her seatbelt by herself . We love thee very much and we say these things in the name of Jesus Christ, Amen." I often have to hold back my little giggles so that I do not break her honest concentration. She is quite proud of her thoughts and often repeats to me afterwards her new thought. I love my independent and thoughtful thinker. 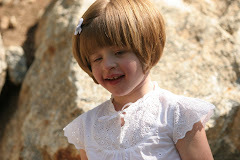 She also has learned to sneak in some suggestions for what she would like to do the following day. Like the other night she said, "and please bless that I can play with Blake tommorrow and that we can share with each other." Note that there was no playdate set up with Blake at the time of the prayer. That is when she is testing out my " Heavenly Father answers prayers lesson." Needless to say we managed to sneak in a playdate with Blake the next day to prove the point.